A few decades ago when I first started pistol shooting I met a man with a sad story to tell. He’d taken up pistol shooting because he liked handguns as guys commonly do. His wife, not wanting to become a “pistol club widow” (which is just like being a “golf widow” except it involves handguns and not golf clubs) decided to join the pistol club too. Pistol shooting is a sport where some people somehow seem to be gifted and some of us just have to work hard. The lady turned out to be one of those who was naturally gifted and within a short time as counted in years she was on the state pistol team. Her husband never made a state team, but he got to do lots of shooting because his lovely wife needed to be out at the pistol club training. So it’s a happy story really. Nancy Tompkins is one of those women who took up shooting, got stuck into the training, and became one of the top American rifle shooters ever. She began 38 years ago which makes her a pioneer in what had been a sport in which the vast majority of competitors were men. Nancy turned that around. 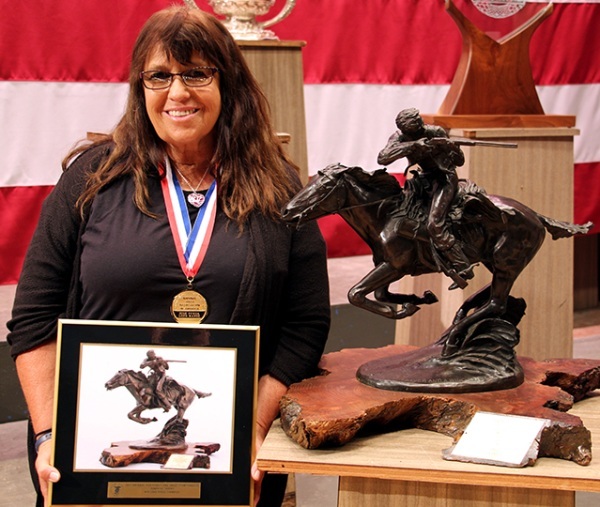 Nancy’s competition resume includes winning the National Long Range Championships 5 times (1986, 1997, 1999, 2003, and 2015), the across the course National Highpower Championships (1998), the Metric Smallbore Nationals (2012) and the Fullbore Nationals (2012). She has also been the Wimbledon Cup winner (1993) and a 7-time Leech Cup winner (1995, 1997, 1999, 2003, 2005, 2011 and 2012). She has won both team and individual medals in the World Championships and has been on 8 Palma Teams (as both a shooter and a coach). It’s an impressive record. 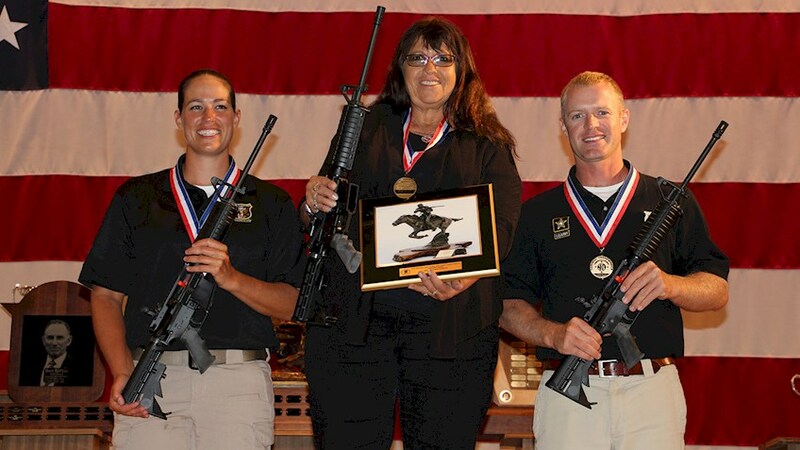 Nancy gets honorable mention on the Lapua website as a member of Lapua Team USA which you can find if you click here. How to build the correct position from the ground up, with detailed explanations on which methods work best and why. Shot analysis clock – learn how to correct bad shots due to position. The most common mistakes and how to correct them. How to find and check your natural point of aim. The best methods for loading the rifle and firing a shot – including breath control, aperture size, wobble area and recoil. How you can benefit from dry firing and electronic training systems. Why it is essential to make the rifle fit you correctly . Which parts of the rifle you should check and how to adjust them. How to select the right shooting jacket, spotting scope, and other equipment. Why a sight level is important. How F-Class differs from prone shooting with a sling. The difference between F-Open and F-TR, and the equipment needed for both. How shooting with a scope is different than with iron sights. Tips for setting up the rifle and reading wind on a smaller target. How to determine eye dominance. About eye nutrition and common conditions. How to protect your eyes while shooting. How different types of exercise can help you become a better shooter. How food and medications can affect your performance. Mental training and visualization techniques. Visual training exercises that teach the brain and eyes to work together. Different methods of relaxation – including breathing exercises, mental imagery and music. About natural ability and why it isn’t essential to success. How to set short term and long term goals. Why you should keep a shooting journal. Use long range targets to determine sight corrections. How to get the most out of your sighters. The differences between wind flags and mirage, and how to use them to your advantage. How to deal with the most common types of wind conditions. How to choose a wind indicator. Why it is essential to have a good wind zero. Why calling your shots and having an accurate rifle are more important than you think. How to overcome the challenges of shooting in extreme temperatures and poor weather. How to handle illness and obnoxious competitors. How to troubleshoot your equipment when things go wrong. How to get ready for a competition, from loading ammo to making a training plan. What to do (and not do) before a big match. What you need to know about shooting in other countries. The differences between string firing, pair firing and three to the mound (and other information). Everything you need to know about traveling – selecting luggage, packing, choosing flights, safety precautions, and more. Tips for flying with rifles and other equipment. How to handload your ammo – everything from selecting your brass to seating your bullets. How to care for your loaded ammo. How to choose the right parts for your new rifle. Why it is important to keep your barrel and other equipment clean. How to build a positive and successful team. Why coaching isn’t limited to on the firing line. How other shooting disciplines can benefit you. Why it is important to pay attention when scoring and pulling targets. 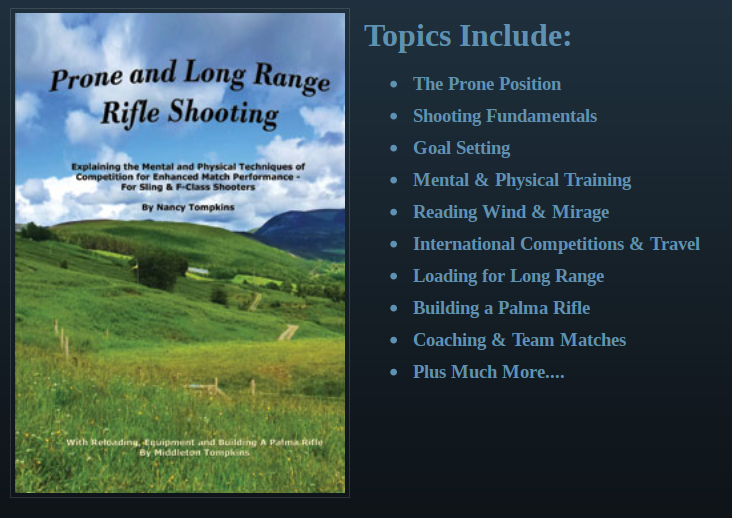 As you can appreciate this is a comprehensive book filled with Nancy’s expertise gained from almost four decades in rifle shooting sports. You can find this book on Nancy Tompkin’s web site if you click here. You will find this book on Sinclair International’s web site if you click here. The book is also available at Brownells if you click here. (Feature image at the head of this post courtesy accurateshooter.com. All other images and quotations courtesy Nancy Tompkins).